Every year, more than one half million college students are targets of bias-driven slurs or physical assaults. Every day, at least one hate crime occurs on a college campus. Every minute, a college student sees or hears racist remarks or images. The American Conference on Diversity (ACOD) President & CEO Elizabeth Williams-Riley shared these sobering statistics during the opening remarks of Diversity Issues in Higher Education conference last week. “What we want to do here today is interrupt these patterns of hate to create more inclusive campuses for all of us, not just some of us,” she said, before a filled room that included New Jersey Secretary of Higher Education Rochelle Hendricks. 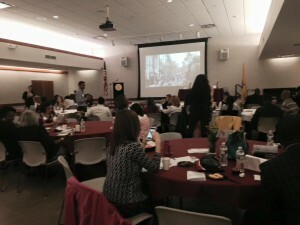 As the nation watches the race-related events unfold at the University of Missouri, the lessons learned during the 15th annual event – drawing attendees from academia, government, corporate America, and the nonprofit sector to Ramapo College of New Jersey – reinforces their importance and immediacy. The challenge placed on the conference participants was to make head, heart, and hand connect. American Conference on Diversity knows that it is simply not enough to have knowledge without compassion and action. “We have committed significant resources to many programs with the specific aim of fostering diversity and equity here,” said Ramapo President Peter P. Mercer. 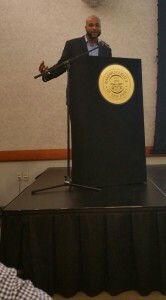 Assistant Vice President of Student Affairs at Southern Connecticut State University Dr. Christopher Catching kicked off the full-day event with an inspirational keynote. By sharing his personal journey to success, he drove home the need for educational access and equity for underrepresented students, including first-generation, low-income, and immigrants, gained through a combination of mentoring, peer support, and financial aid. 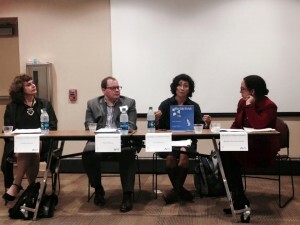 “Opening pathways to success is critical for underrepresented students,” said Dr. Catching. A Newark native whose father “cleaned toilets at a hospital for a living,” Dr. Catching credits the Educational Opportunity Program (EOP) at Montclair State University for providing “cultural navigators” that eventually led to his Doctorate of Education from Rutgers University. 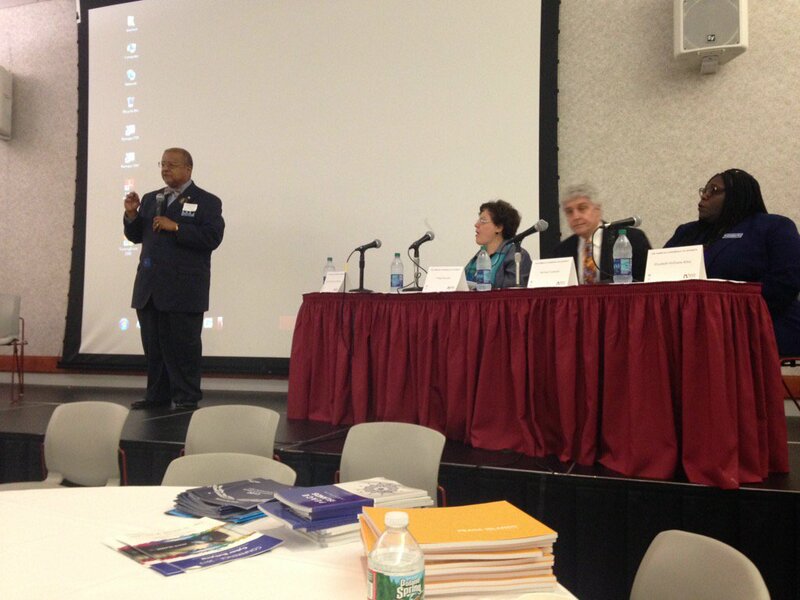 A response panel discussion moderated by Kean University’s Director of Affirmative Action Programs Dr. Charlie Williams followed. 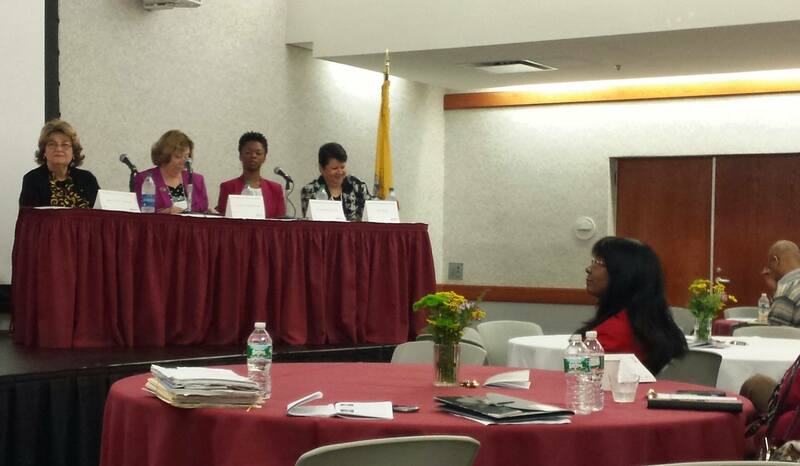 Panelists included Barbra “Babs” Siperstein, Democratic National Committee Executive Committee Member, Vice President of the Women’s Political Caucus of New Jersey, and Political Director of the Gender Rights Advocacy Association of New Jersey; Middlesex County College President Dr. Joann La Perla-Morales; Beyond the Tenure Track CEO Fatimah Williams Castro, Ph.D.; and ADP Chief Diversity & Social Responsibility Officer Rita Mitjans. 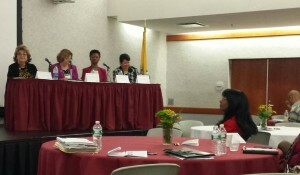 Keynote response panelists (left to right): Barbra “Babs” Siperstein, Dr. Joann La Perla-Morales, Fatimah Williams Castro, Ph.D., and Rita Mitjans, with New Jersey Secretary of Higher Education Rochelle Hendricks in the audience. “While We Are Changing: An Exploration of Transgender Identity” – Throughout this heartfelt discussion, led by Executive Director of the Women’s Rights Information Center Dr. Esmilda Abreu-Hornbostel, panelists told personal stories intersecting their own or family members’ navigation through the educational system. Panelists included: Teachers College Columbia University Instructor and National Speaker on Gender Diversity Amy Fabrikant; Aaron Potenza of Garden State Equality; and Licensed Professional Counselor Jennifer Whitlock. Transgender session (right to left): Dr. Esmilda Abreu-Hornbostel, Amy Fabrikant, Aaron Potenza, and Jennifer Whitlock. 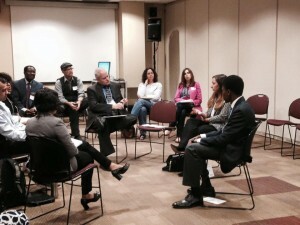 Student Perspectives on Diversity in Action Session, a student-led roundtable represented by Kean, Ramapo, Rutgers, and Seton Hall Universities, validated the challenges underrepresented students face. Leo Ricketts (far right), a Seton Hall student who works two jobs to support a mom living with a disability, said it’s often difficult to connect with his peers who are not aware of their societal privilege. Another suggested that schools implement a mandatory diversity class for students and bias training for staff and faculty. The students reflected on numerous encounters they have had with implicit bias. One student shared the consistent assumption that Black students only get to college to play athletics. This is in the wake of the University of Missouri athletes becoming the game changers on campus. Crowning the event was a robust conversation, moderated by Rev. Dr. Forrest M. Pritchett, Faculty Mentor of the Freshman Studies Program and Program Director of the Dr. Martin Luther King, Jr. Leadership Program at Seton Hall. Panelists included: ACOD’s Ms. Williams-Riley, Educational Testing Services Senior Vice President and Chief Administrative Officer Yvette Donado, and Peace Islands Institute New Jersey Branch Media Advisor Michael Gabriele. Dr. Pritchett posed a series of stimulating questions to lay a foundation for the examination of rigorous models for action. What, if you could, would you ask the governor of New Jersey? “When was the last time you had a conversation about privilege,” replied Ms. Williams-Riley. Ms. Williams-Riley emphasized the importance of talking about unconscious privilege just as much as we talk about implicit and unconscious bias. Rev. Dr. Forrest M. Pritchett poses thought-provoking questions to panelists (left to right): Yvette Donado, Michael Gabriele, and Elizabeth Williams-Riley. Special thanks to the statewide conference planning committee: American Conference on Diversity, Bergen Community College, Bloomfield College, Brookdale Community College, College of St. Elizabeth, Kean University, Montclair State University, New Jersey City University (NJCU), Ramapo College of New Jersey, Rutgers: The State University of New Jersey, Saint Peter’s University, Seton Hall University, William Paterson University, and Corporate Partners BASF, Enterprise, and L’Oréal USA. Next year’s Diversity Issues in Higher Education conference will be held at NJCU. If your institution would like to be a part of the Planning Committee for next year’s event, please contact us at Info@AmericanConferenceOnDiversity.org. The American Conference on Diversity was founded in 1948 as the National Conference of Christians and Jews. Today the programs, services, and initiatives of the American Conference on Diversity are among the most important work focused on creating a more inclusive society. It is the unfinished business of living in a highly diverse nation: educating and empowering our next generation of leaders; enhancing our workplaces; and helping to create inclusive communities. The American Conference on Diversity builds on a historic mission and creates programs and activities relevant and vital to 21st Century life. It is a journey we can all take together. The American Conference on Diversity operates Regional Community Networks covering all of New Jersey. Visit www.AmericanConferenceonDiversity.org to learn more.